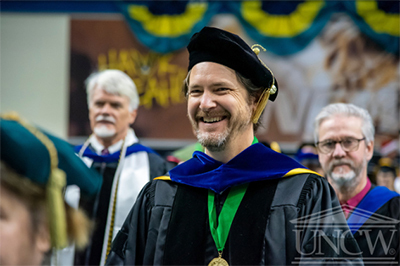 UNCW graduated 1,837 undergraduates, 449 graduate students and 10 doctoral students during the fall 2018 commencement ceremonies on Dec. 15. Join Nick Hudson, associate professor of art & art history (left) and relive the magic moments through photo highlights. The next SWOOP will be sent on Jan. 8, 2019.